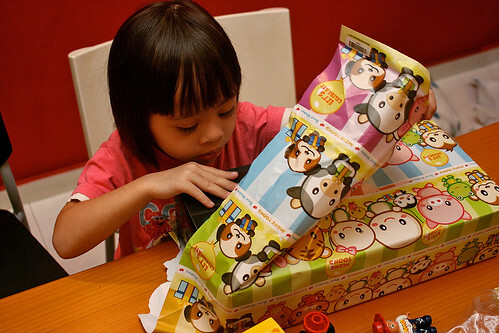 Lots of presents! Toy Story 3 train set we got her and Jolie on behalf of grandma. Both of them love trains. Jolie also got some toys, just so she doesn't feel left out. 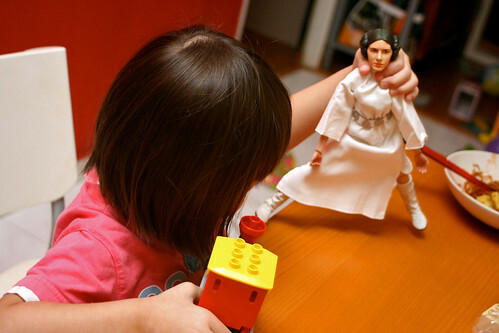 She finds out that plush Yoda does not have levitation skills. We could not resist getting Nadine this R2-D2 backpack, but it seems Jolie likes it more! Oh heck, I want it, even if no one else does! Maybe I can use it as my next camera bag, haha - it sure has plenty of padding! I think she likes it! Already, practising the death grip...use the Force, Nadine! Exploring with great curiosity. Under the skirt is always a good place to look. 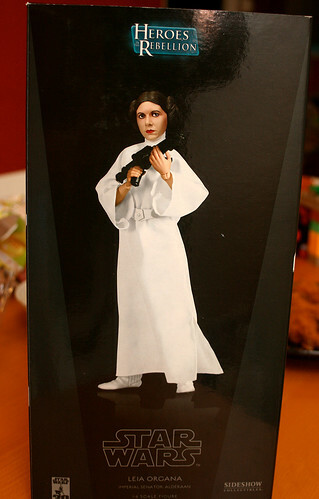 The doll is very poseable! 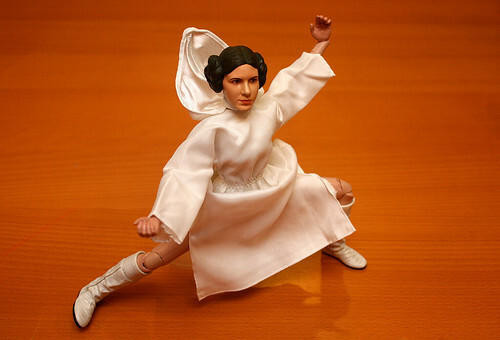 This one is also very poseable! 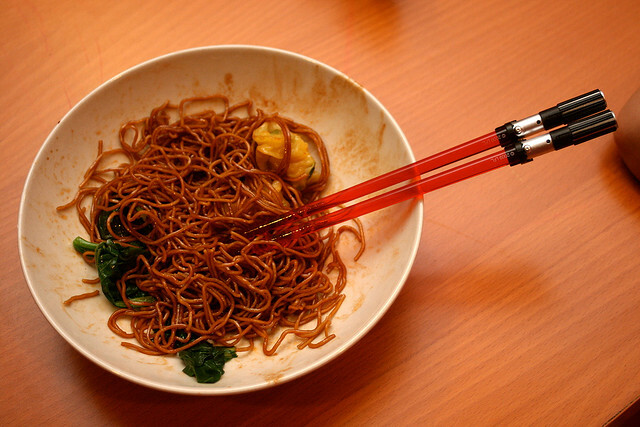 Oh, and if you are curious - yes, the light saber chopsticks are being used. Meanwhile...four days in Hong Kong lie ahead for me. Wish me good weather and good luck in finding nice things to eat! The chicken wings look great! Did you fry them yourself? Love the R2D2 backpack, where did you guys get it from? After reading your blog, I went out to buy the Saber chopsticks as well as the Yoda, haha! Was a hit with my hubby, so thanks for the recommendation. Enjoy HK, pure eating heaven! your 2 daughters are so lovable! :) seems both of them are star wars fans too! Shirley: You mean Tim Ho Wan? I tried looking for it but I think it was closed (or I was just blind). Not fated to eat, maybe. There are mixed reviews on Openrice, so this might be blessing in disguise. Seems Fook Lam Moon has two Michelin stars, but I have very little time left to check out much the next 2 days. Anonymous: yes, we fried them ourselves. They're the CP Mexican Wings - very easy to make, and delicious! NEL: yeah, those eyes - we can never say no to her! 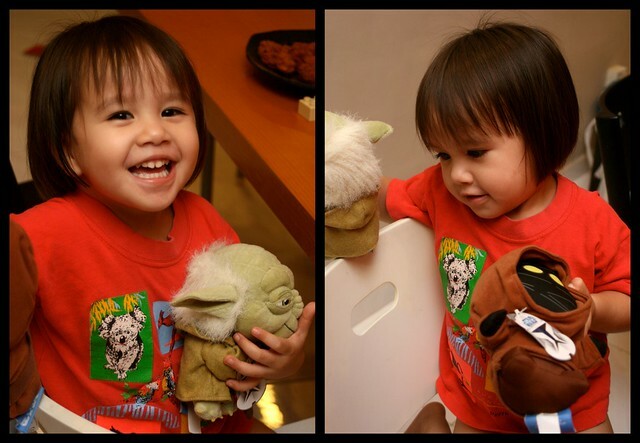 Charmaine: hehe actually the parents are the Star Wars fans, giving them an early immersion. Jolie will watch a whole movie with us, but Nadine not so keen if there's no music and singing in it. Chenyze: thanks! it was hubby's idea not to leave out Jolie. He's always so considerate (well, also gives him excuse to splurge on more Star Wars merchandise). The R2-D2 is from Simply Toys (see details above). yr kids are so cute! Happy belated birthday to Nadine and ur hubby! And congrats on winning the best food blog award! :) This post of Nadine and that bag is so cute! See u all on wed! Happy Belated Birthday to Nadine and Raoul!! May God's Blessings follow you throughout the new year!! Fook Lam Moon has 2 stars? I am suprised. Will have to check it out the next time I go to Hong Kong. Happy belated birthday to both your darlings (big and small)! 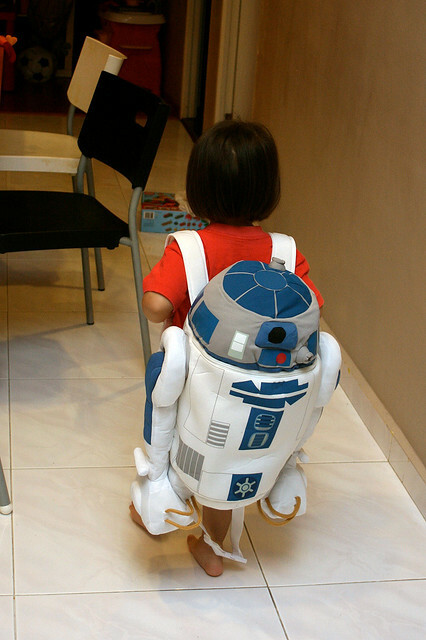 That R2D2 bagpack is so cute!! Hahaha. Your daughters are blessed to have such a supportive mum who captures many photos of their early life. These will be treasured memories in their many years ahead.